When the Victoria Derbyshire programme's reporter Noel Phillips was stopped and searched by police twice in four months, he said he felt stunned and terrified. On both occasions he said he had been doing little more than going about his daily life.I could feel the officer's hand reach into my pockets. "We're going to put some gloves on and we're going to search you. Have you got any sharp objects"No. What have I done? ""You've been detained under the Misuse of Drugs Act for a quick search," came the reply.I felt bold enough to respond: "I've never used drugs in my life". It was an evening in June this year and I had been out with a couple of friends in central London.Heading home, we were too early for our train so sat on a wall on a street outside the station.We were talking, watching time go by, enjoying the evening when two police officers approached us. "Are you smoking cannabis?" they asked, "we can smell it coming from your direction. "I was stunned, and terrified - being accused of something we weren't doing. "To me, you're sitting round a corner and there's a really strong smell of cannabis, OK, which has led us to believe that you do have it on you," the officer continued.Of the three of us, it was only me who was searched by the officers. I was also the only black person. According to Home Office statistics, if you're black, you're eight times more likely to be stopped by the police than any other ethnic group.Stop-and-search has been used 300,000 times across England and Wales in the past year, the lowest annual figure since 2002.Four months later, it happened to me again.I was close to my house in north London when plain-clothed officers approached me. "We're looking for knives. What are you doing here?" one asked. "I'm on my way home. My house is just over there," I said, pointing. Soon after I was detained and searched for drugs - not a weapon as initially suggested.I had my mobile phone in my hand throughout. When I said to the officers I intended to record what was happening, the detective sergeant grabbed my phone and stopped the recording.I asked what intelligence they had gathered prior to detaining me. "None," said one of the officers. Insp Beattie says stop and search powers are used "to take weapons off the street"
Stop and search is regulated by the Police and Criminal Evidence Act 1984 (Pace) and the Criminal Justice and Public Order Act 1994.A police officer must have either a reasonable suspicion or belief that an offence has already been committed in order to carry it out.After complaining about my experience I was issued with a written apology by Insp James Beattie from Stoke Newington Police. "I apologise for the fact your phone recording was seemingly stopped when officers removed your phone from your hand. You did have a right to record what happened," he stated in his letter. On a breezy Tuesday night in Stoke Newington I joined Hackney's rapid response unit, following an offer from Insp James Beattie.At 18:20, officers receive a 999 call from a shopkeeper who says he was threatened by a 16-year-old white boy with a flick knife. With blue lights flashing and sirens blaring, Inspector Beattie and his colleague rush to the area where the boy was last sighted.The young boy and his friend - a 15-year-old black boy - were tracked down in Hoxton, East London where they were detained. A knife was not found on the 16-year-old but cannabis was discovered on his friend, who was arrested and taken back to the station for questioning.I asked Insp Beattie if stop-and-search was being used to target young black men. "We're not looking to blanket search young black men. We're looking to search gang members," he tells the BBC's Victoria Derbyshire programme. "If we get calls and see someone that matches [an alleged perpetrator's] description, they're going to get searched - whether, as is the case today, a young white guy, or a young black guy. "The reason we're out on the streets using stop-and-search powers is to take weapons off the street and prevent people being killed, and also to act as a deterrent to those people who do choose to carry knives. "So I hope people can trust us, that we're working with the best intentions to protect people." Former Met Police special constable Adam Pugh says unconscious bias is a "massive issue"
Since 2010, complaints have been made in relation to around 2,000 instances of stop-and-search by the Met Police, figures obtained by the Victoria Derbyshire programme show.Fewer than 5% of these were upheld.Adam Pugh, a former Met Police special constable, says he has seen "many police officers stopping people, what I consider, based on racial prejudices because of the colour of their skin". "I think that unconscious bias is a massive issue within the Metropolitan Police that permeates the entire service at every level," he says. Barry, a 14-year-old boy from Tottenham whose surname we have not used, says he was stopped and searched by police on his way home from school six months ago. "I dropped my keys on the pavement and police officers came over asking me if it was a knife," he tells me. "They turned my bag upside down on the street. "It was so ridiculous. I have rights, so I don't understand why they would stop and search me for something so ridiculous. 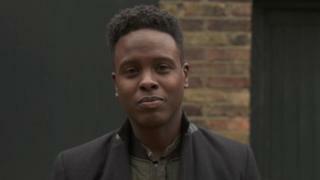 "He believes many young black men see police officers as more of a threat than a friend.When your only contact with the police occurs under duress, it is easy to understand why there is resentment.Watch the Victoria Derbyshire programme on weekdays between 09:00 and 11:00 on BBC Two and the BBC News Channel.